I was inspired by the movie, "The Fountain" to create this work. The image is taken from the Mayan codex, that illustrates the story of First Father going into the underworld. He sacrifices himself and becomes a great seed, the giver of life and order in the universe. 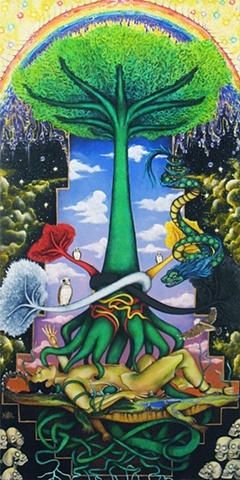 Through him grows the world tree which connects Heaven: the home of the Goddess Ixchel, the Rainbow, and her garden of celestial flowers, Earth: which is said to be located on the back of a caymen, and the Underworld: Xibalba, home of the ancestors, located somewhere in the arms of the galaxies above. Kukulcan, the Feathered Serpent watches his realm protectively as the four guardian owl gods roost on their respective cardinal direction.